Welcome to Faith Matters - your daily reminder that your faith matters greatly! 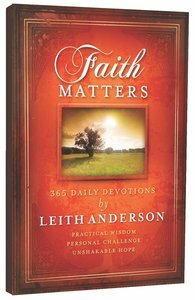 Internationally respected pastor Leith Anderson, president of the National Association of Evangelicals, takes readers on a compelling 365-day journey where lessons of faith are discovered in out-of-the-ordinary, surprising placesall in just a few minutes a day. Packed with practical inspiration, hope, and encouragement for busy people, Faith Matters is fresh, contemporary, and relevant. Its engaging tone, winsome stories, and real-life relatability challenges readers to understand their faith better, reveals intriguing details about the people and stories of the Bible, and motivates all to live out their faith where it matters - in every day and every moment. Faith Matters is based on a daily two-minute radio program heard in cities across America and overseas.